IB Biology Topic 8: Metabolism, Cell Respiration and Photosynthesis Detailed objective-by-objective summary notes for Topic 8: Metabolism, Cell Respiration and Photosynthesis for IB Biology SL/HL. Contains information on everything you need to know from 8.1 to 8.3, according to each understanding, application or skill. Written by a IB HL Biology student who graduated in with a 45/45. IB Biology Topic 7: Nucleic Acids Detailed objective-by-objective summary notes for Topic 7: Nuclear acids for IB Biology SL/HL. Contains information on everything you need to know from 7.1 to 7.3, according to each understanding, application or skill. Written by a IB HL Biology student who graduated in with a 45/45. 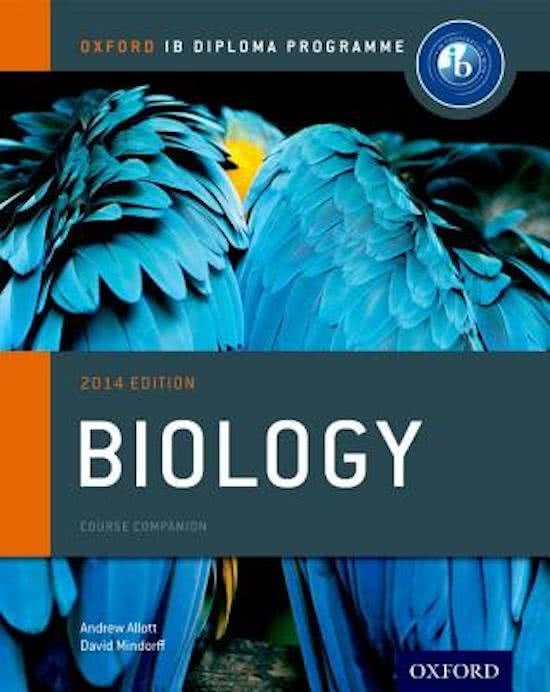 On this page you find summaries, notes, study guides and many more for the study book IB Biology Course Book, written by Andrew Allott & David Mindorff. The summaries are written by students themselves, which gives you the best possible insight into what is important to study about this book. Subjects like Biology, SL, International Baccalaureate, IB Biology, IB, HL, biology & Genetics will be dealt with.